The fish gods work in mysterious ways. Welcome to my first post for February. 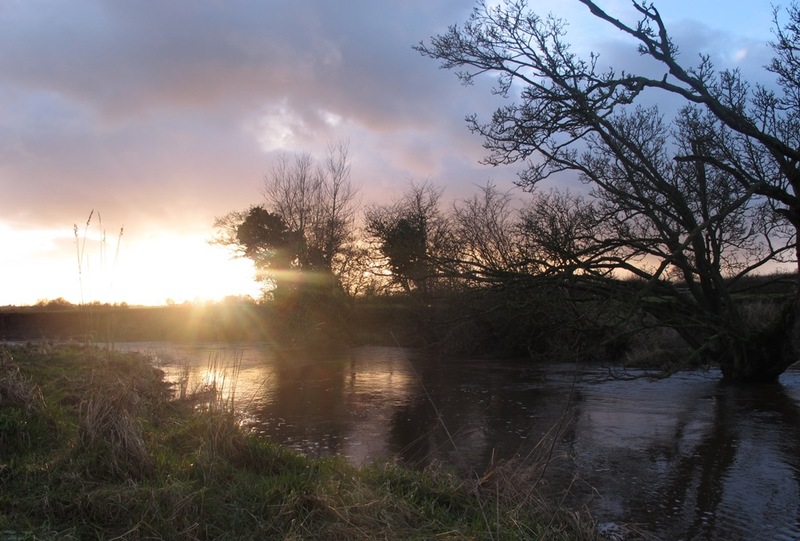 As usual I’d planned for a days chub fishing on the river Dane at Daisybank, everything was fettled by mid-week, tackle sorted and January’s Blog published so what could go wrong? The forecast was for high winds on the Saturday and after last weekends ‘umbrella’ antics I decided to keep a close eye on the weather leading up to my weekly session. 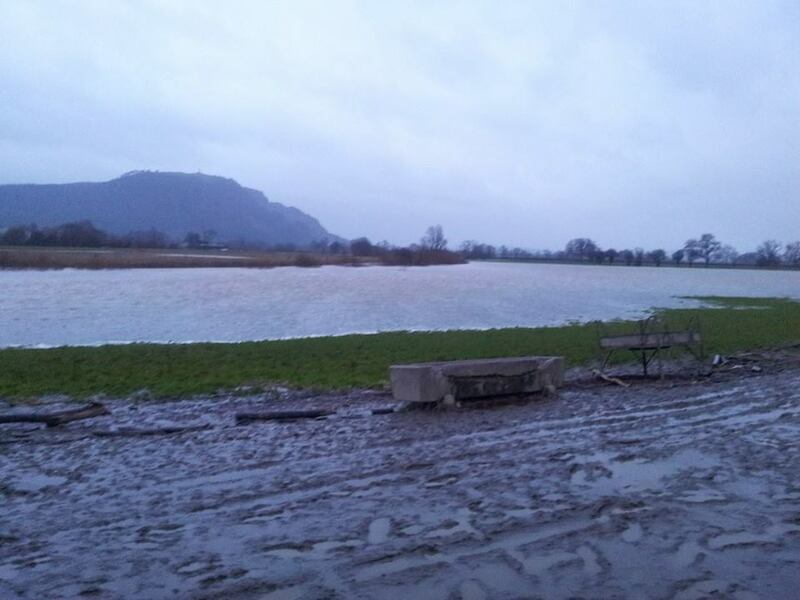 By Friday I saw a rising river and had a feeling of Deja-vu, this wasn’t good, rain was forecast and I went to bed late on Friday knowing it would be a waste of time making an early start. After some further thought and keeping a close eye on the levels I decided to pay a visit to Llandrinio on the Upper Severn. I planned to do a night session on there and drive back up to the Dane on the Sunday where the weather looked much calmer and very little rain forecast. The Dane was dropping and would be almost perfect by Sunday morning so by Saturday mid-afternoon and with the car packed I set off for Llandrinio some seventy miles away. 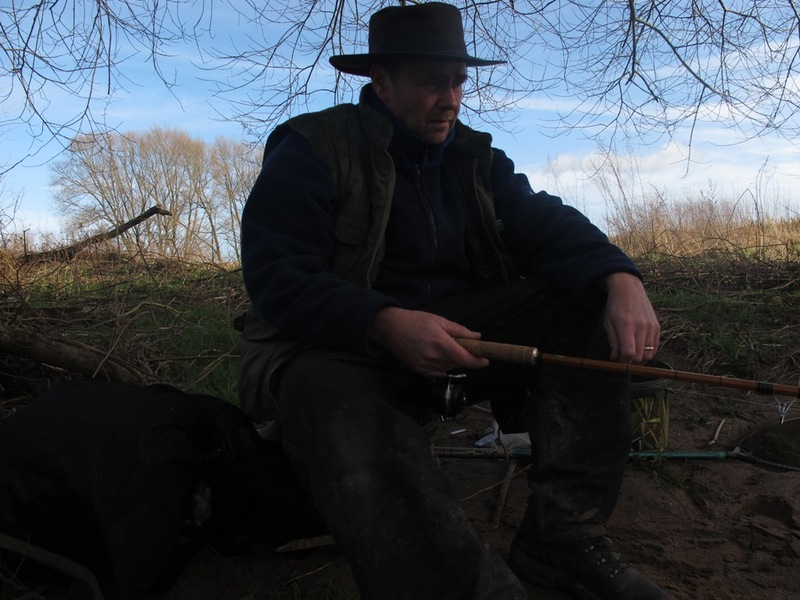 Arriving at Llandrinio around 5:30pm I decided I would pitch the brolly near a deep hole where a regular had informed me a big barbel had been caught in the summer. On a previous visit I’d noted a big snag midstream and this would allow me to at least hold bottom, I parked the car in the usual spot and glanced towards the river. 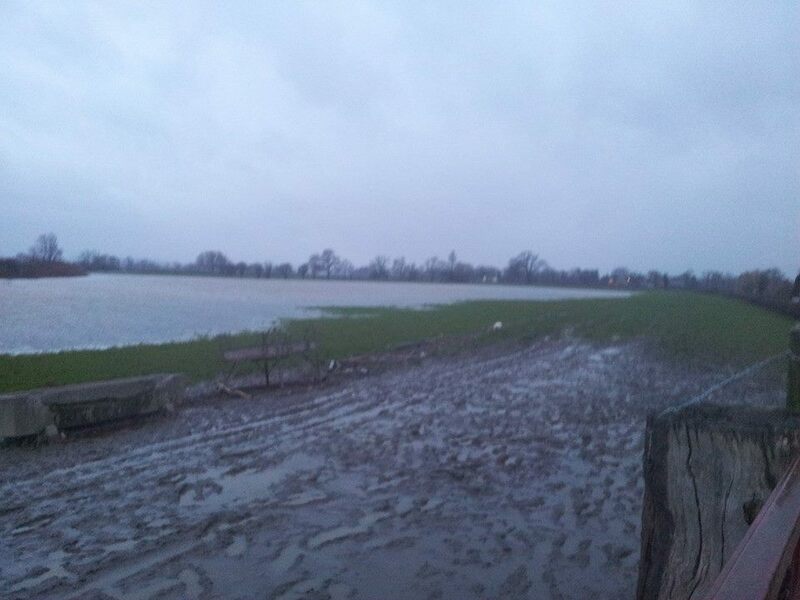 It was not only over the banks but had flooded the field and was up to the cattle feeding area!! The rain was blowing in my face as I took a couple of photos and I dived back in the car to have rethink. 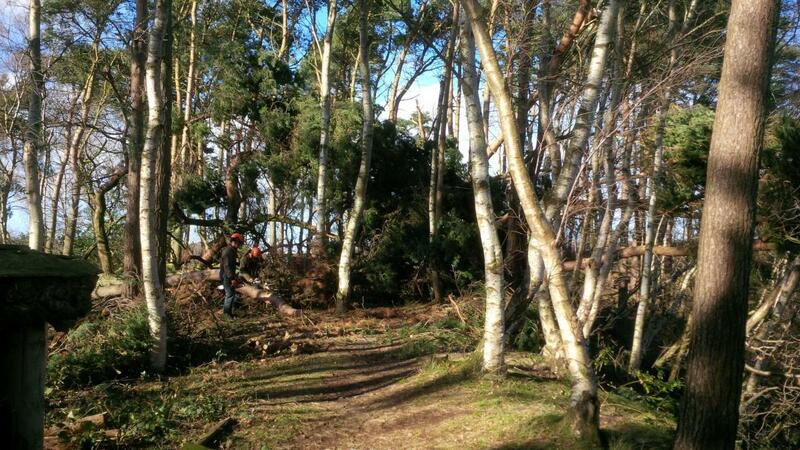 Far bank tree tops just visible, compare it to the summer photo and you get some idea of the height. Bugger!! Seventy miles and two hours after leaving home I was no better off and what’s more I wasn’t fishing. Having followed the river levels how could I have not realised the river would be in the fields, I felt a bit daft really!! Hitting the road again it was a quick pit stop at MacDonalds for a bite to eat and a hot drink and then onto the Dane. I finally arrived at 8:30pm five hours and 130 miles after leaving home. 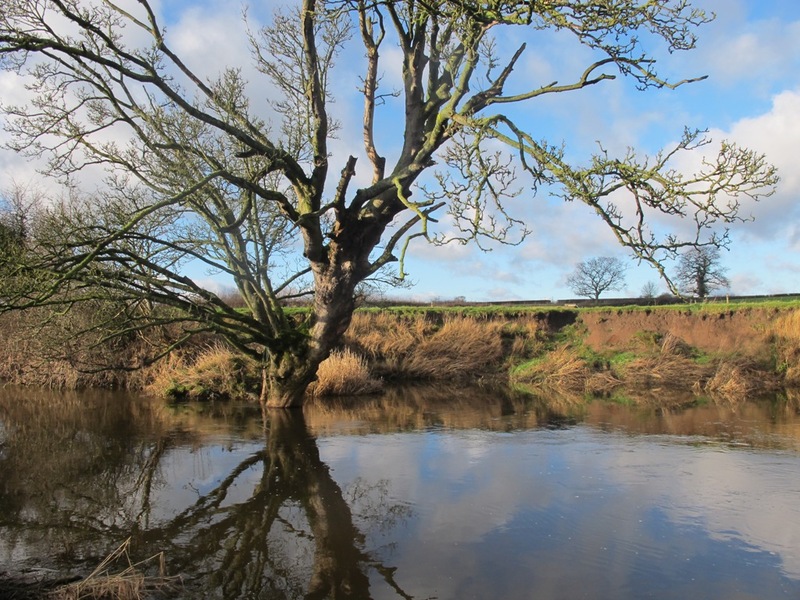 I headed straight for the Oak Tree swim a deep pool near the end of the stretch, bedchair under one arm and brolly in my quiver. 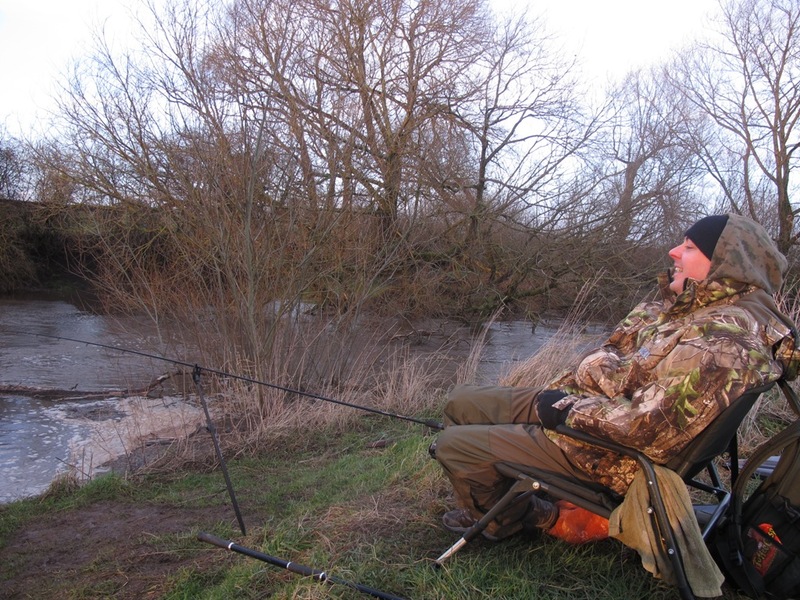 I was set up and fishing in double quick time, the bedchair was arranged with the backrest upright and the rods positioned inside the brolly for a quick strike should I get a bite during the hours ahead. I settled into my book, a trip down memory lane for me with Jack Hargreaves Fishing for a Year. 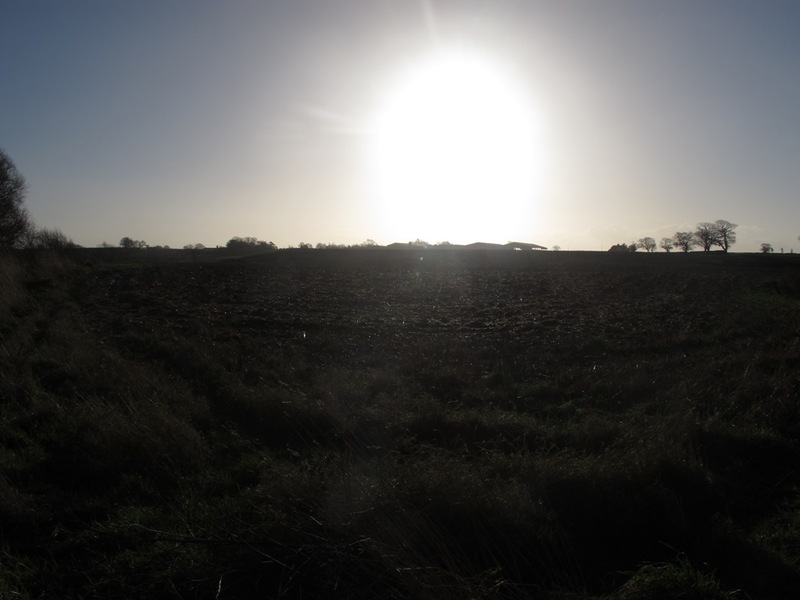 By 4am I was really tired so reeled in and got my head down waking a few hours later to a gale blowing across the top of the brolly, things died down and I managed another couple of hours sleep until 8:30am when all appeared quite calm and promising. 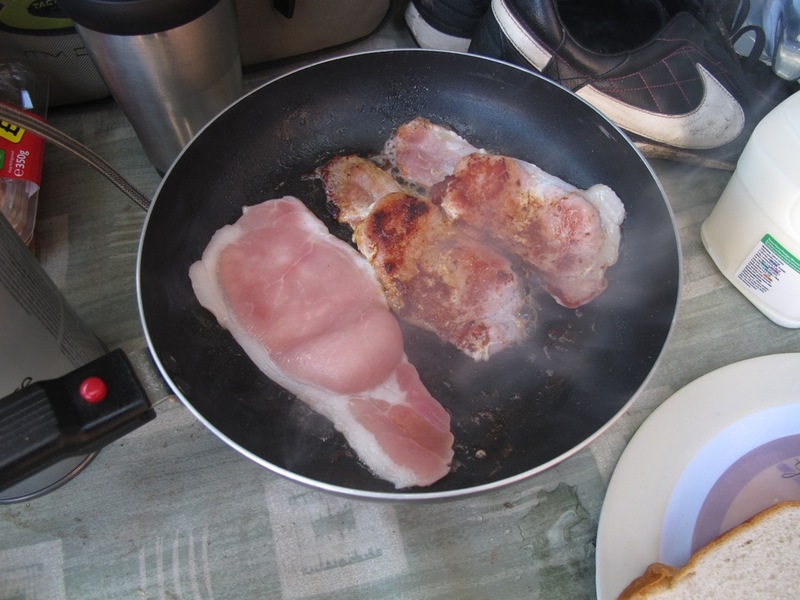 I packed up the overnight gear and headed back to the car for there in the boot lay the bacon and a much-needed breakfast. 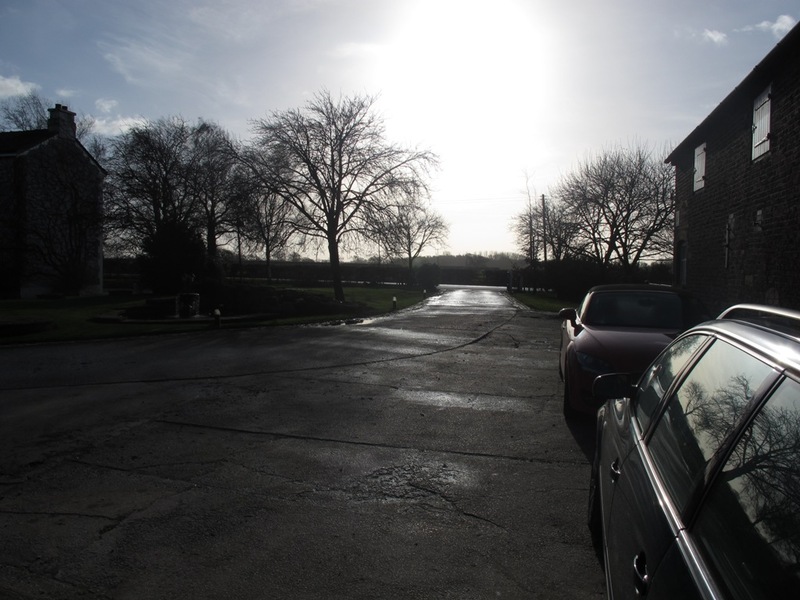 The Daisybank dog came over and marked his territory next to the car, the sun was trying it’s best to break through the cloud and as the bacon sizzled in the pan all was well in Grazy’s world. Fully refreshed it was back onto the fishing. I fancied a try in the Sandbank swim, usually a productive peg but one that needs approaching carefully for fear of spooking the fish. Moody self take, well I was bored!! Nothing came of the swim so after an hour I moved again and dropped into the corner swim where I’d had a fairly immediate take on previous sessions. This time I was rolling meat under the trees when it jolted left and I was in!! Just as I lifted into it I watched the line cut into my left and snag on some reeds, whatever had the bait managed to take plenty of line off the Mitchell without as much as making a sound. 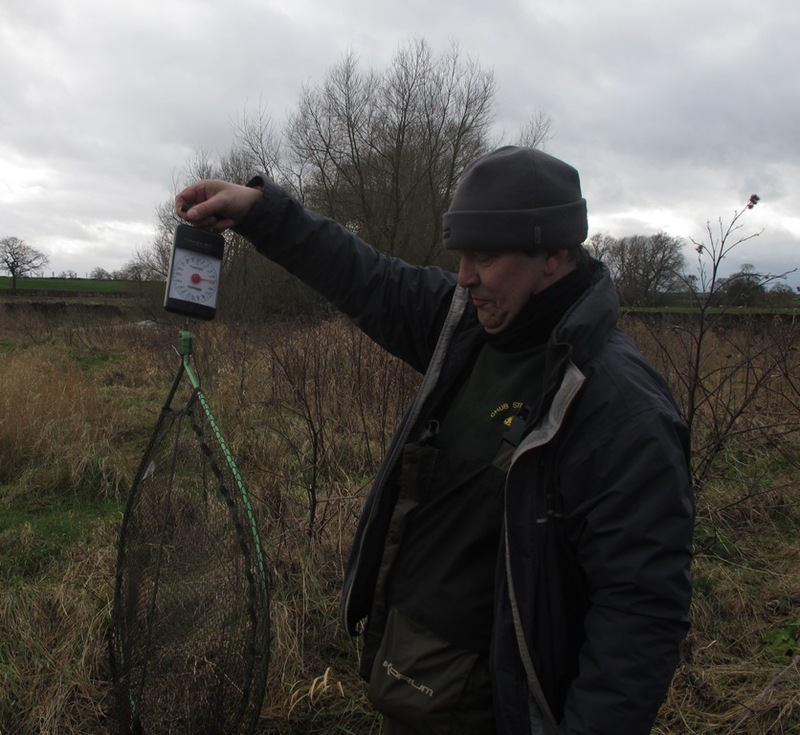 As I stood up and applied some side strain the dreaded mobile phone sprung into life, bad timing on their part as I pulled the hook in the process, it was well off downstream as was my only chance of a fish thus far. 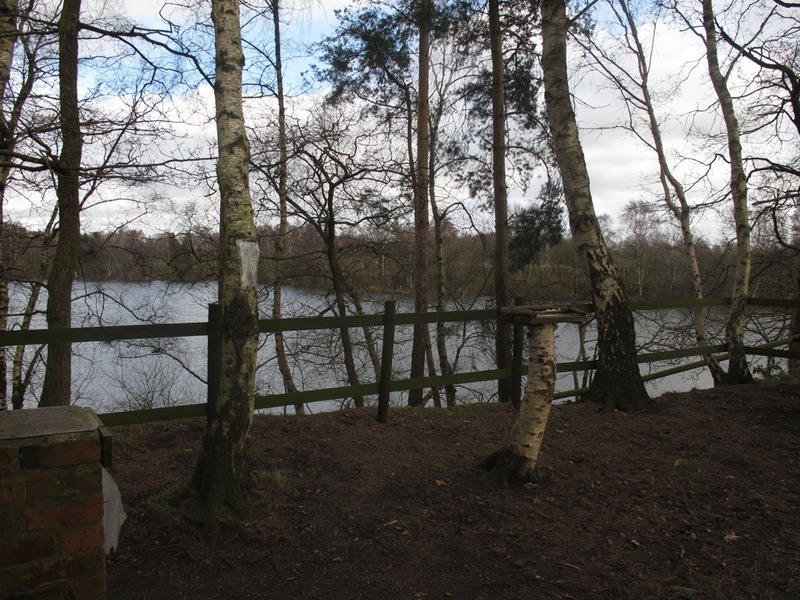 I moved along to the Island swim and cast in a feeder stuffed full of bread crumb and hemp, it snagged on the retrieve and I lost the end tackle. By now it was getting on for 4pm so I moved for one last time and headed off to the Raft swim in search of the Dane monster who’d pulled my string on at least two occasions in the past. Just after the gate I looked down at the first swim and decided I’d give it an hour before reaching the Raft swim some 50 yards upstream. 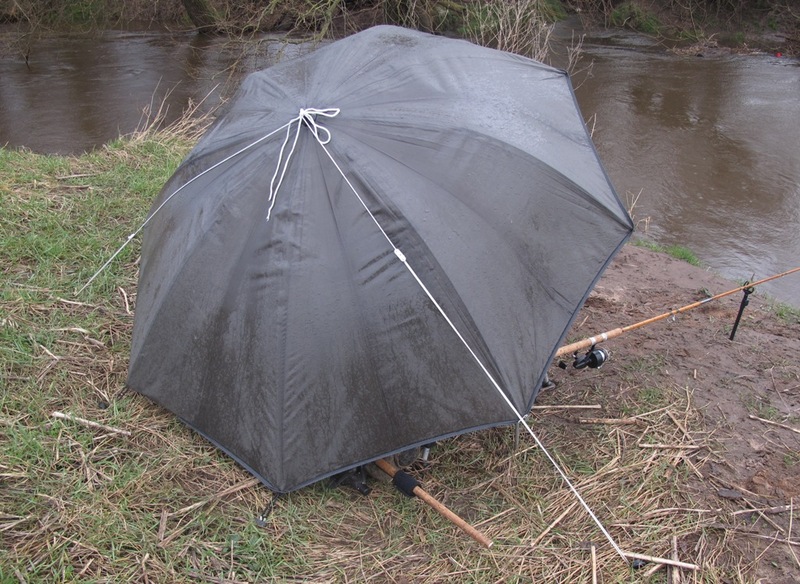 It was almost calm apart from an occasional gust so I put up my brolly to keep the wind off my back and started fishing. I noticed the line had become very curly mainly due to stretching the mono when snagged up so I loaded it with brand new 6lb mono on top of the old stuff. 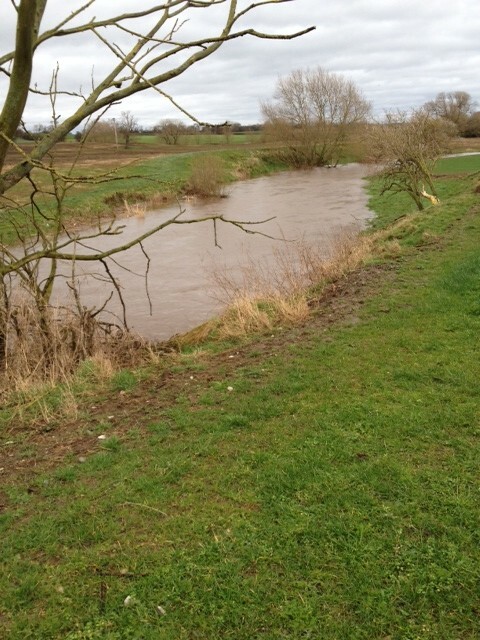 There is a slack over by the far bank tree laying in the field (yes the Dane can be fairly powerful when in full flow!!) 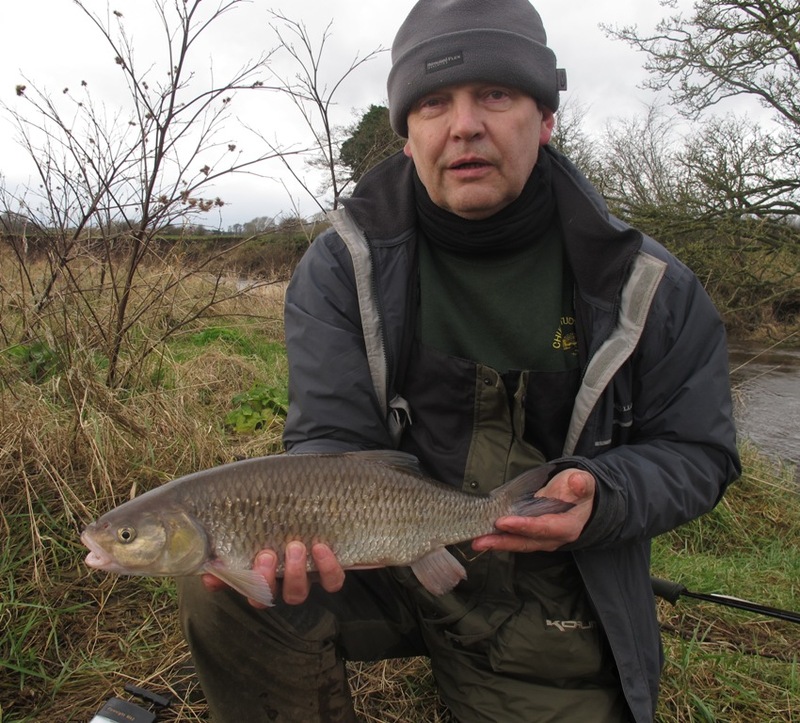 and I fancied it for a chub holding in the rushes so I loaded up a 2oz cage feeder and cast across, it landed perfectly a foot short of the reeds and dropped out of sight. Unusually it didn’t attract any interest so after half an hour I lifted the rod to reel in only to discover it was snagged solid, the only option was to pull for a break. Reeling in I was resigned to a blank and thinking about starting to pack up, it was Sunday evening and I had work in the morning but instead I put a hook straight on the line and had a single chunk of meat left so in it went. The meat ended up about 20 yards downstream and I could see it on the surface, with no weights at all on the line it just floated in the flow. 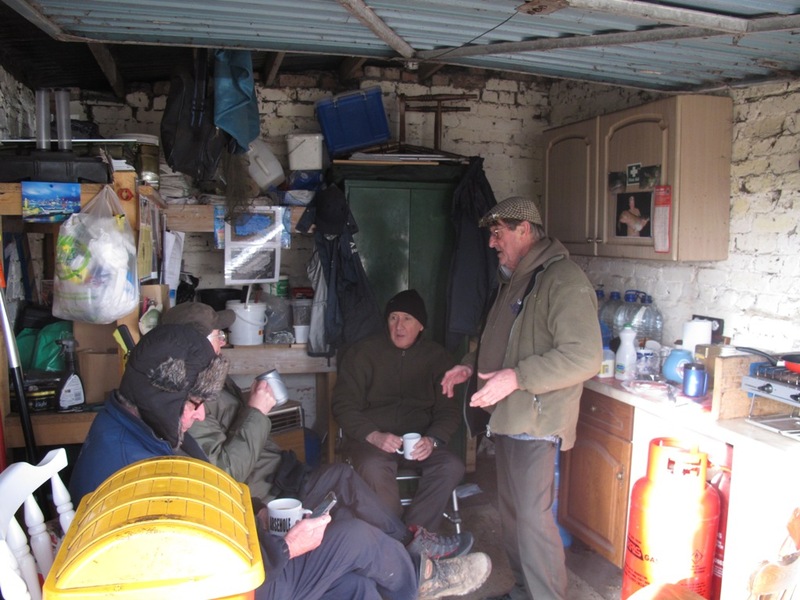 I sat down and started to get my kit together, one last cup of tea before the flask was finished, why not it’ll warm me up a bit, a final slice of cake oh go on then……. The meat must have eventually sunk as the line was tight into the nearside margin and I couldn’t see the bow wave it created on the surface any more, the nite-lite flicked deliberately left, yes a bit of interest at last, then it pulled steadily around causing me to lift the rod and pull away upstream, the tip arched over as I stood up and I felt a solid connection, I was in!! The line had caught in the reeds and as I took up the strain everything went slack, the rod wasn’t bent any more, the line was flat and my hopes even flatter, as I reeled in I was cursing the fish gods but suddenly all went tight again, the fish was still on!! What followed next I can only describe as the most exhilarating battle I have ever encountered with an as yet unknown quarry. Initially it just seemed to sit on the bottom and as the thoughts flash through your mind I convinced myself I’d hooked into the ‘Dane Monster’ which I firmly believed was a mid double (possibly bigger) river carp, I had tussled with the beast three times to date and lost on every encounter but not this time!! On 6lb line straight through to a strong size 6 hook carefully tied with a palomar knot, I didn’t doubt for one minute that it would fail me. 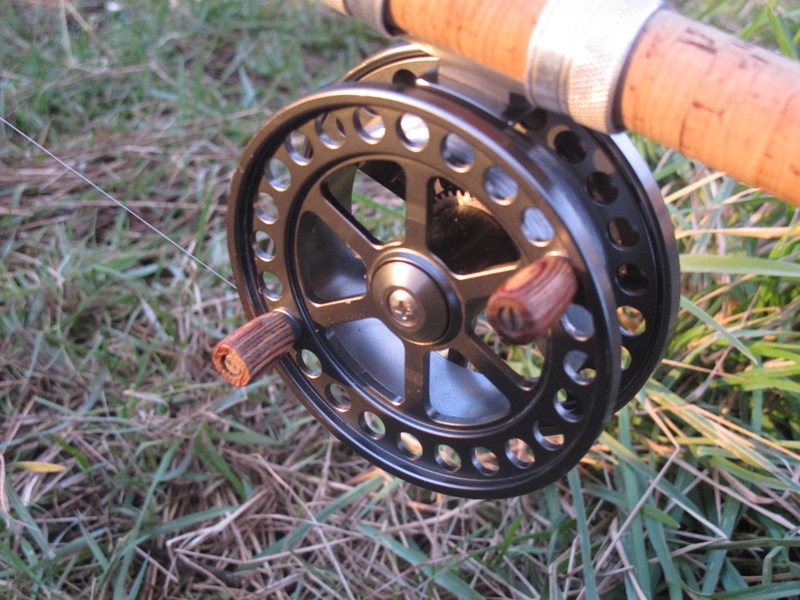 The line was brand new having re-spooled just prior to casting but I was conscious of pulling for a break on the previous cast so it was with a delicate balancing act of rod pressure and back winding that I started to take control of the situation or at least I thought. The unknown quarry decided to plod around on bottom and move from nearside bank to far side bank rattling the reeds in the process, this bothered me because I knew that after recent floods all kinds of debris could be caught up in the marginal foliage and if the fish took me around it I would surely lose it without knowing what it was. 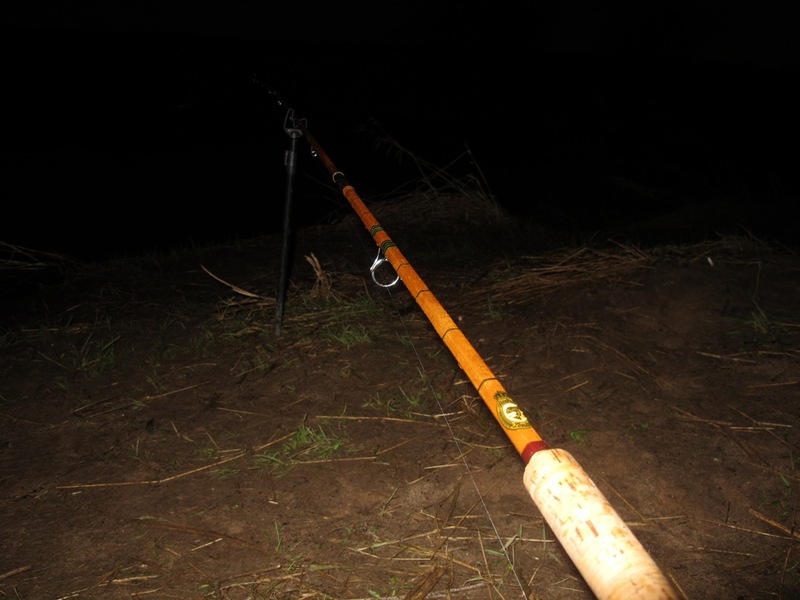 My head torch shone on the rod tip which stood firm during the lunges making me think it was a bit more than the Avon top I’d thought it was, perhaps it was more like a carp rod or heavy river rod but either way it handled the fishes determined runs admirably and as long as I kept up with the back winding the little Mitchell 300 reel didn’t complain either. 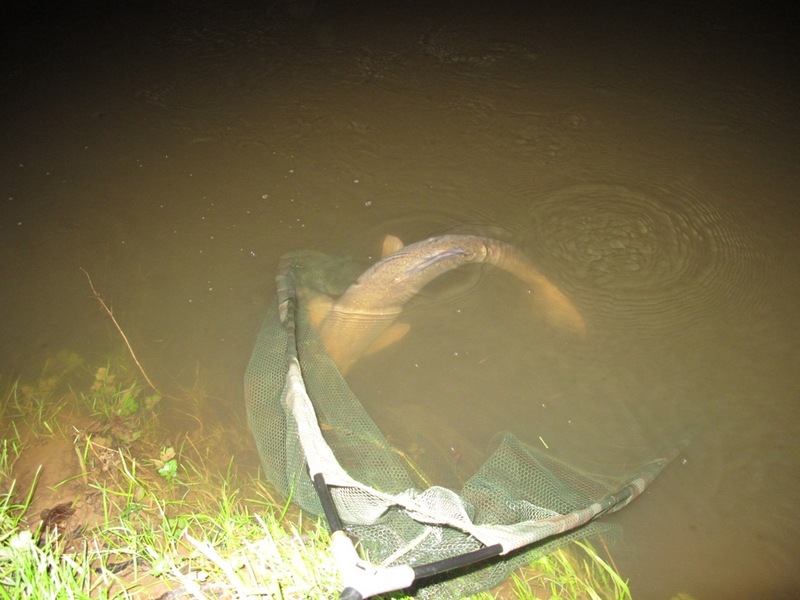 At times like this you wished a fellow angler was within ear shot, not because I needed a hand to net it but simply to share the moment, it continued to battle hard with deliberate powerful runs until eventually my head torch showed the line at such an angle it had to be under my feet about a rod length out in the darkness. I reached for the landing net and it seemed far too small for a big river carp but as I was targeting chub it would have to do. After a further five minutes it finally came up to the surface right in the nearside reed bed and I got my first glimpse of the fish………. 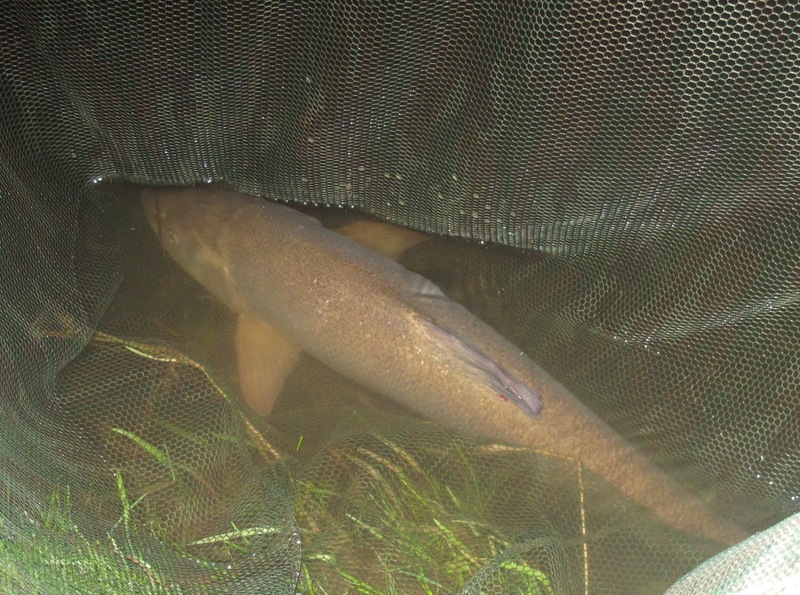 it wasn’t a carp at all but a rather chunky barbel, “well hello Bertie” I said as I put the net in its path, it was side on gulping air and just slid straight over the frame of the net, I lifted and took pressure off the line and it oblige by dropping in without a fuss. Wow!! That’s a double, yes that is a double!! 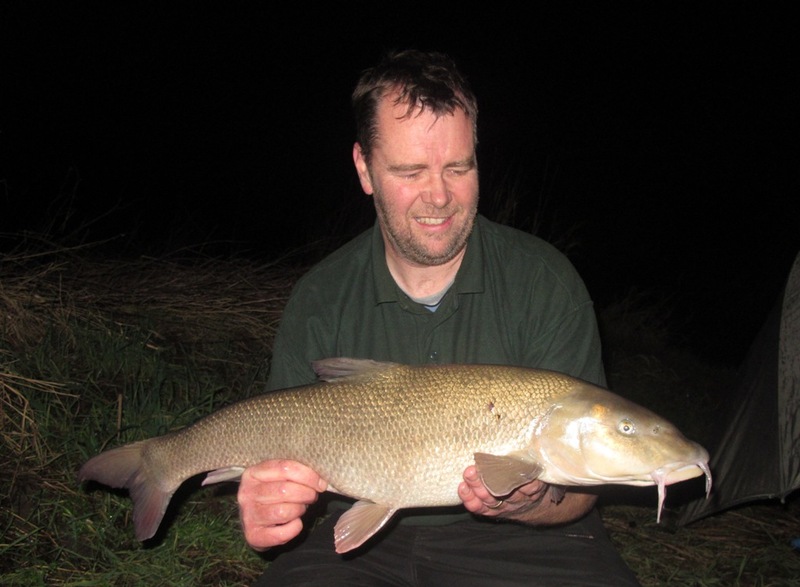 I sat on the edge of the water, the barbel lay still in the margins and for what seemed like three or four minutes neither of us moved. Eventually it righted itself, head upstream and taking in oxygen. I just stared at it admiring it’s form, that might push 11lb I thought, it’s huge!! 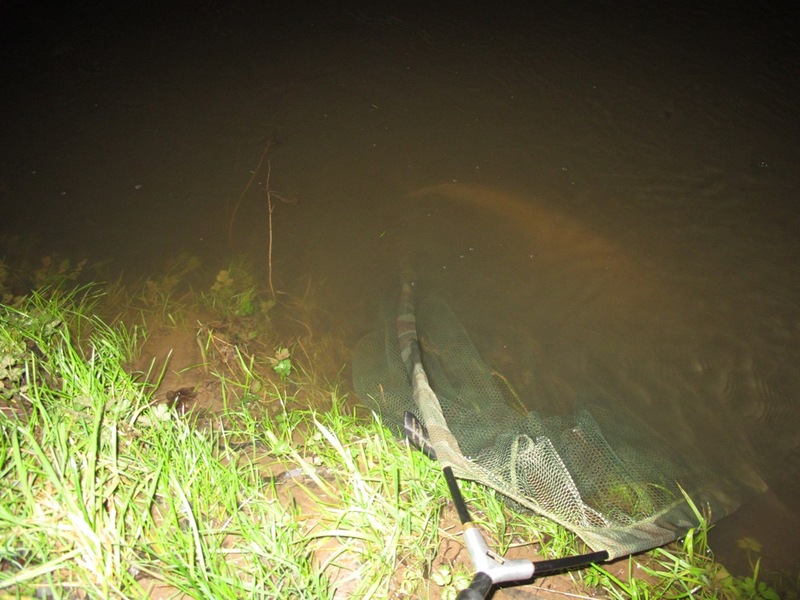 Only one way to find out so I took the weight and scrambled up the bank, I heard a sharp crack which was the landing net handle giving up under the strain but that didn’t matter now. 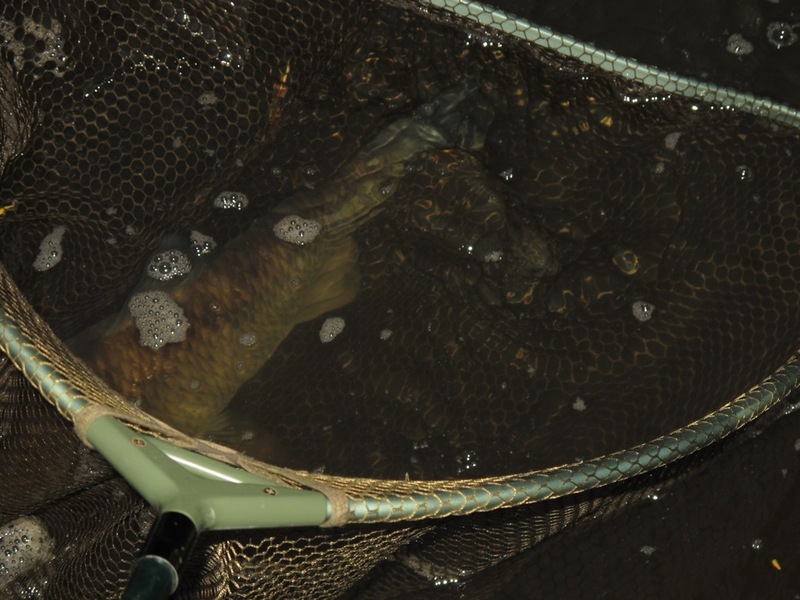 On the mat it was lively and I had everything to hand so having zeroed the Avons I lifted the barbel into the weigh sling, it was solid and muscular not hollow in it’s belly so I assumed it had been feeding well on naturals. 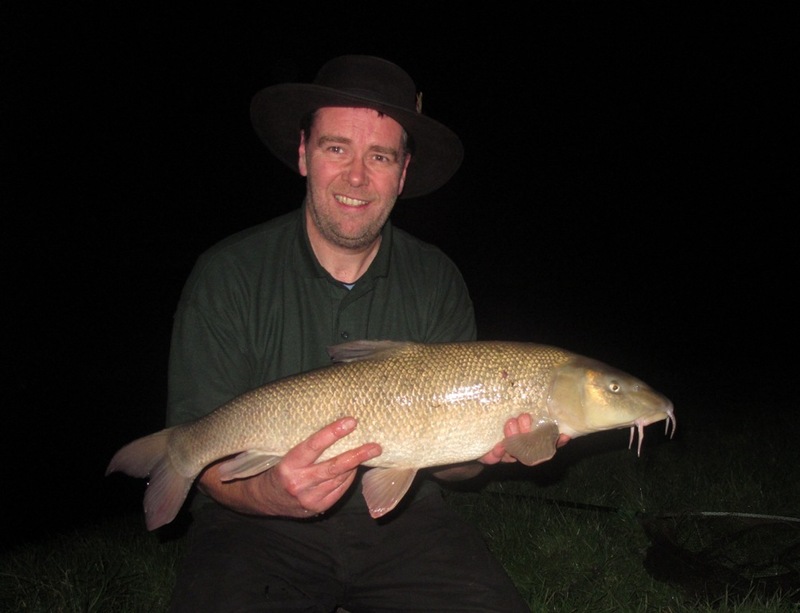 The scales passed 10lb, a full revolution, only once previously had I seen this magical sight, the needle flicked between 5oz and 6oz and eventually settled on 6oz, a new PB at 10lb 6oz, I was one happy angler. 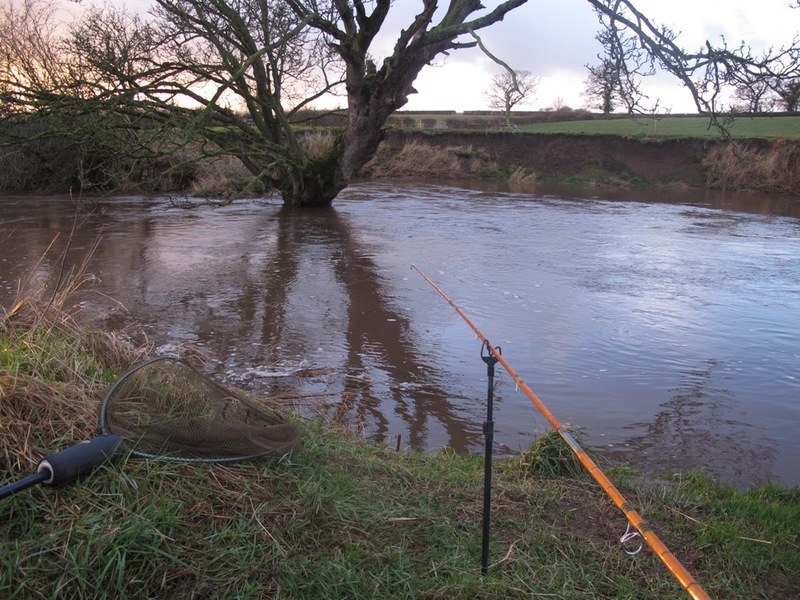 I assembled my barbel net and used a storm pole as a handle, lifting the fish back for further resting I was able to push the storm pole into the bank creating a holding net and allowing the barbel (and myself) a five-minute breather before the photo’s. On the mat it looked magnificent and stayed reasonably calm whilst I took the shot, a Dane double figure barbel and the tackle that has stood the test of time. 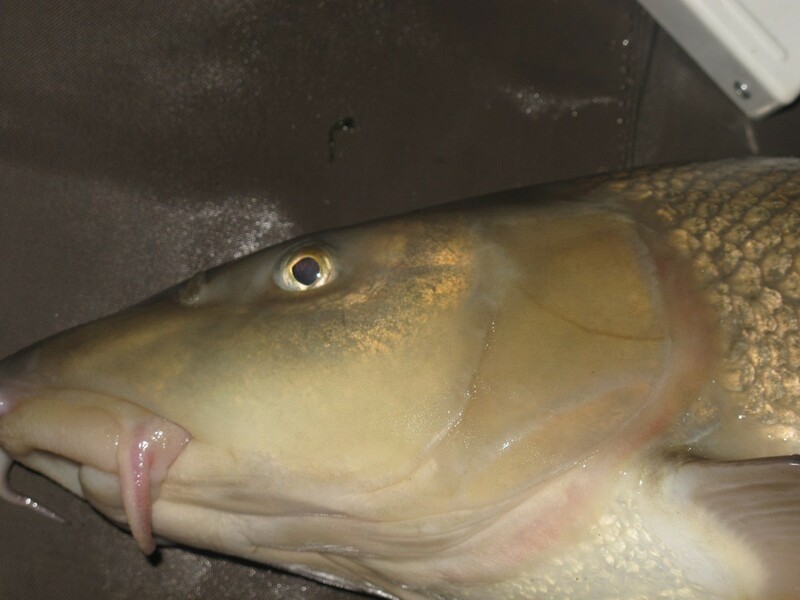 A few self-takes next and a final look, I didn’t want the moment to end but it’s vitally important to rest the barbel before release to ensure he swims off strongly to fight another day. Dropping the rim of the net I watched him eventually reverse out and with a turn and a flick of the tail he was gone. I sat down in the chair still grinning, what a result!! How do you follow that? Well to be honest as far as ‘ole Bertie’ is concerned I’ll be happy if that’s my lot between now and the 15th March but I’d really like to catch a 5lb chub just to make my best season so far on the Dane complete. You’re only as good as your last goal is a term often heard in football circles and I enjoyed the previous weeks congratulations from the angling community, some I know well some I don’t know at all but all sharing in my achievement last weekend. It was a real boost to the old confidence not just because I landed a Dane double but because my method was simple, as simple as it gets really. 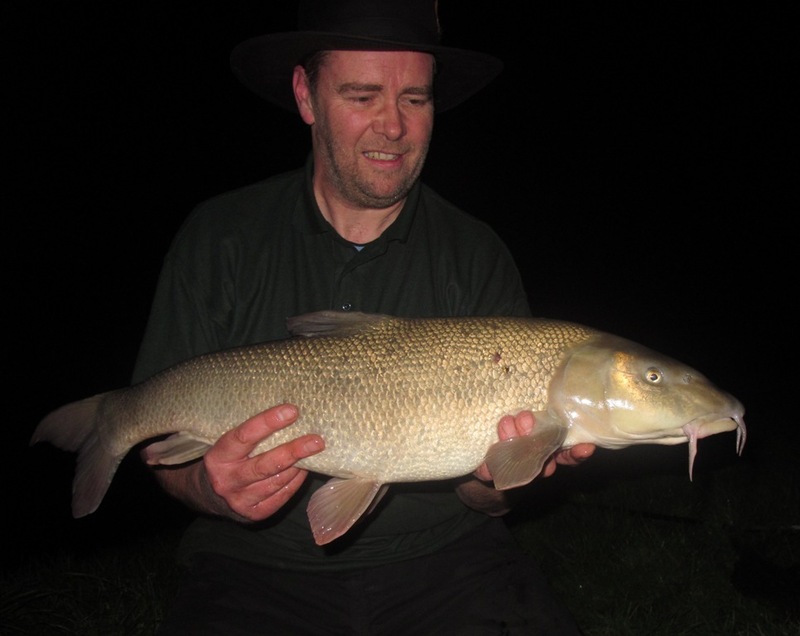 During the autumn months when the river was low and clear we all moaned and groaned about the rivers needing a good ‘flush through’ but I had most of my success with letting the bait roll through the swim using just 3 swan shot or sometimes no weights at all. 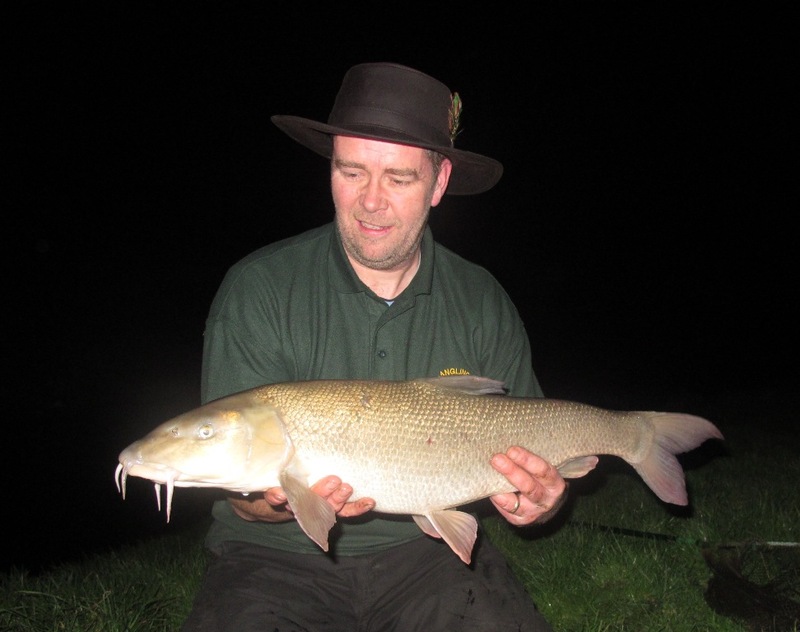 Last weeks capture was not caught by design and that’s what makes it so special, the fact it was a big barbel was a bonus. Back to this weeks session, I’d kept a close eye on the weather forecast and it predicted high winds with some showers in the afternoon. 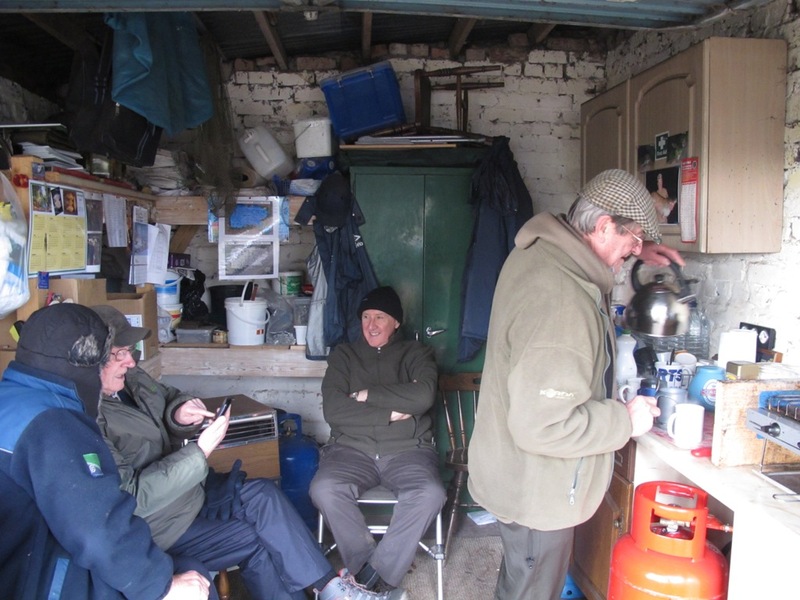 I’d arrange a visit to Lymmvale the jewel in my angling clubs crown and arrived around 10:30am just in time for a bacon buttie and a natter with the lads. An hour later I was back on the road and heading to the river Dane, Phil was already there and had dropped into the Oak Tree swim where I’d spent the night last Saturday. 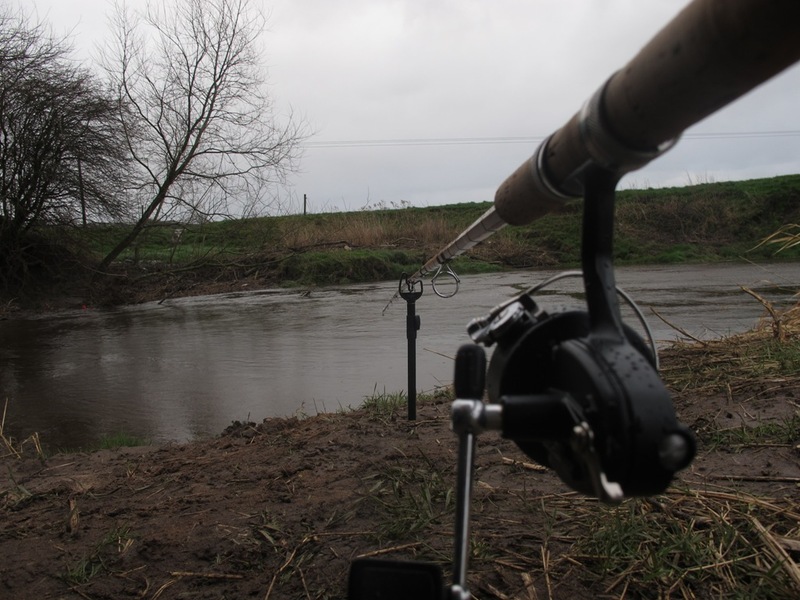 I left all my gear on the Willow peg and took a wander down stream to meet Phil and have a brew, the wind was already up and with rain due at 1pm it wasn’t going to be the easiest of sessions. Phil chosen swim for the day, this photo was taken last month and today was a bit more coloured. Phil was fishing the spot behind a bush right under his feet, a little back eddy although the river actually looked on form albeit a little coloured, he was on cheese paste and within five minutes of me sitting down his rod jerked off the rest and it was game on!! I grabbed my camera and started snapping the action. 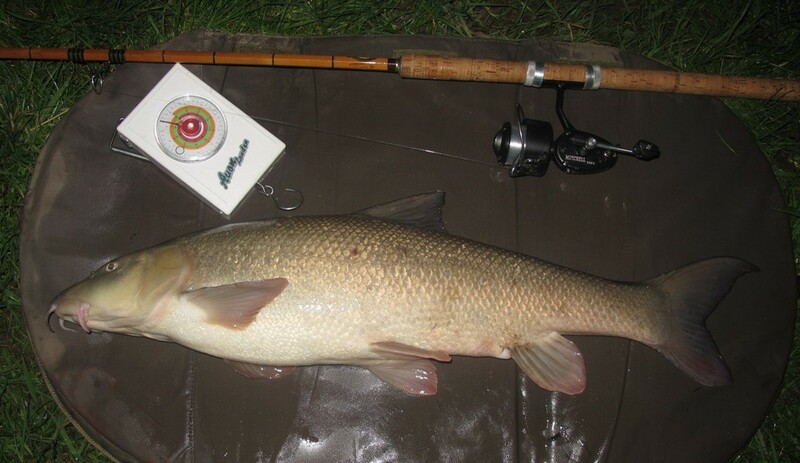 A good chub was the end result, 3lb 8oz on the scales. 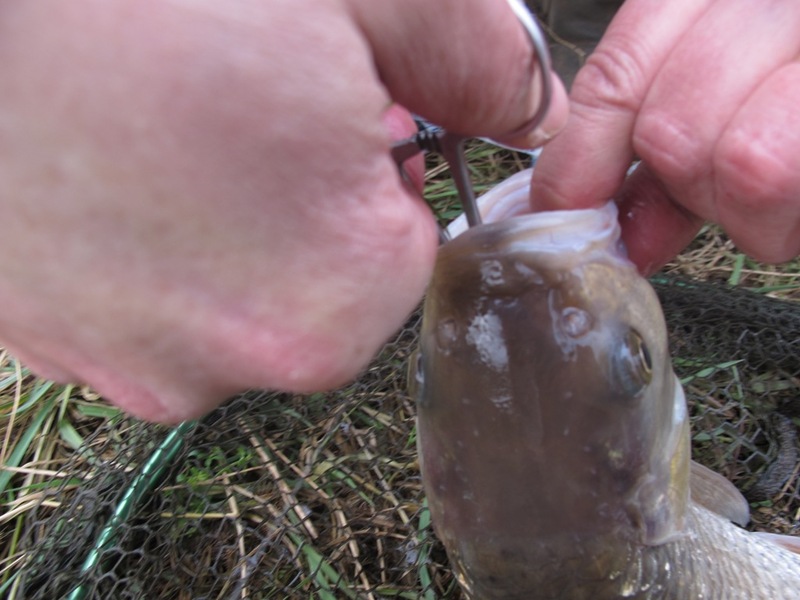 The size 8 hook was buried and we needed the forceps to unhook the greedy chevin. Smiling nicely for the photo and Phil nearly smiled too!! I congratulated Mr Hatton on his chub and we settled down to that cup of tea I’d poured earlier, to celebrate I cut two slabs of walnut cake and Phil gave it a try for the first time discovering that he actually liked it, all those years wasted, never mind!! Back at my swim I approached with caution, the wind was on my back so the brolly was put up and (this time taking no chances) pegged down to ensure it didn’t get blown away. I couldn’t get a bite and as the rain arrived the outlook for the remainder of the day was bleak. I moved along to the island swim and first cast snagged up so pulled for a break, I’d said goodbye to Phil earlier and he’d said I should not take any risks on the less accessible swims so I headed for the Raft swim in search of the river carp for the final couple of hours. 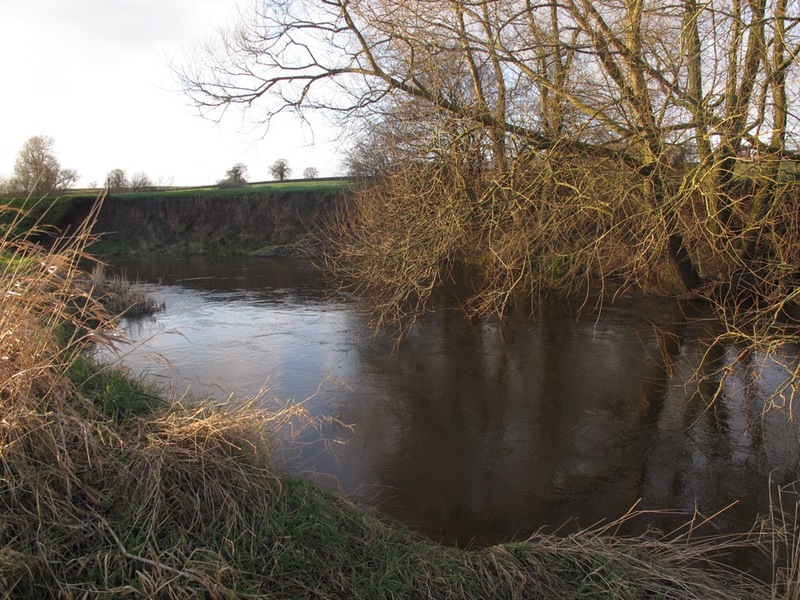 Just over the gate and upstream of where I had the barbel last week I noticed a fresh outcrop of level bank, with the river dropping it had appeared out of nowhere and as I stood on top of the bank Phil’s advice was going through my mind ………. two minutes later I was descending the steep bank on my rope like a mountain goat, quiver strapped to my back and the remainder of the gear balanced on the ridge. It was actually a very comfortable swim and one I’ll look out for in June because it gave me a new piece of water to go at, it was pushing through at this point so I fished the inside line trying meat and then cheese paste in turn. The brolly was sheltering me from the rain and the steep bank from the wind, it was almost perfect apart from the lack of action. The evening brought with it more rain followed by more rain so at 9:30pm I packed up and made a dash back to the car and, apart from the weather, I really did enjoy the day, a blank for Grazy on this occasion but then that’s fishing for you and a day spent fishing with good friends is never a day wasted in my book. This week I’d arranged to meet up with river novice Phil Chatterton who’d asked if he could join me for a day on the Dane. 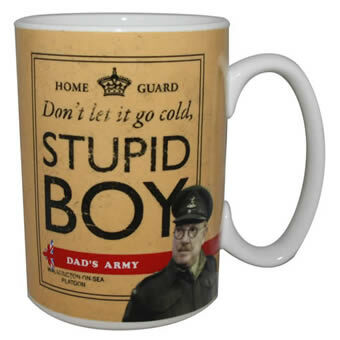 I’d prepared Phil for the worst, the country is in flood and the Dane is no exception. 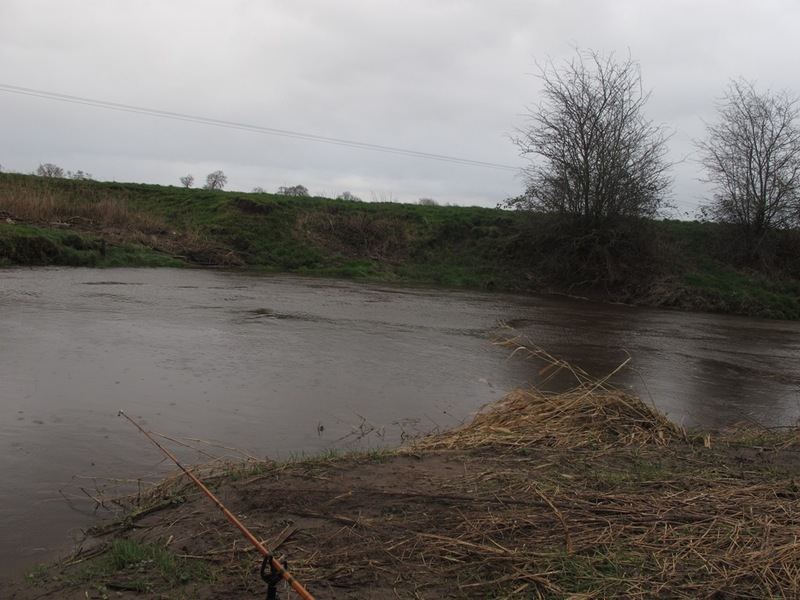 Although it has been fishable most weekends a predictable pattern was emerging mid week, a big storm had hit the UK on Wednesday with gusts of up to 100mph followed by a cold front bringing further heavy rain and winds on towards the end of the week. 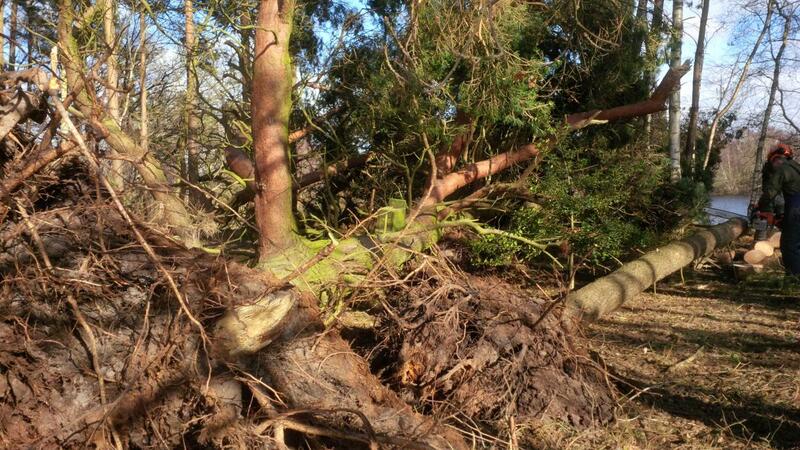 Our tall trees at Lymmvale became casualties of the high winds and the venue was closed for anglers safety as the estates team started the clean up. 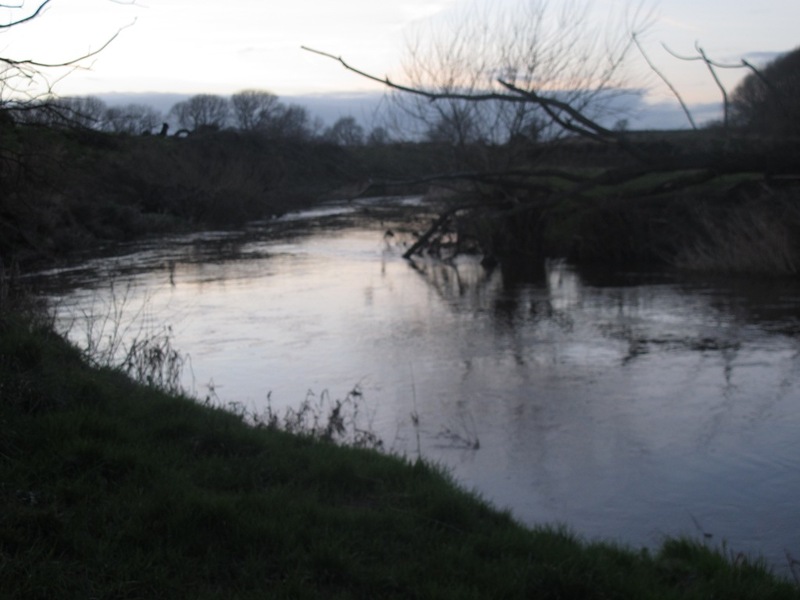 Friday night and the levels at Rushton some 20 miles upstream of Daisybank started rising rapidly and an all too familiar story started to unfold. I’d arranged to meet Phil at early doors however due to unforeseen circumstances my early start was scuppered and I ended up looking after my poorly son Adam who had suffered during the night with a tummy bug. Phil was well on his way when we spoke so I re-assured him I’d be down no later than lunchtime and gave him sufficient instruction to find the swim I’d had the double on two weeks ago, not that I expected Phil to bag a double figure barbel first cast but rather that the peg is flat and will easily accommodate two anglers. We kept in touch and Phil eventually found his way down to the river and sent me a photo to assess it’s condition, unfortunately the levels were well up and the river very coloured. 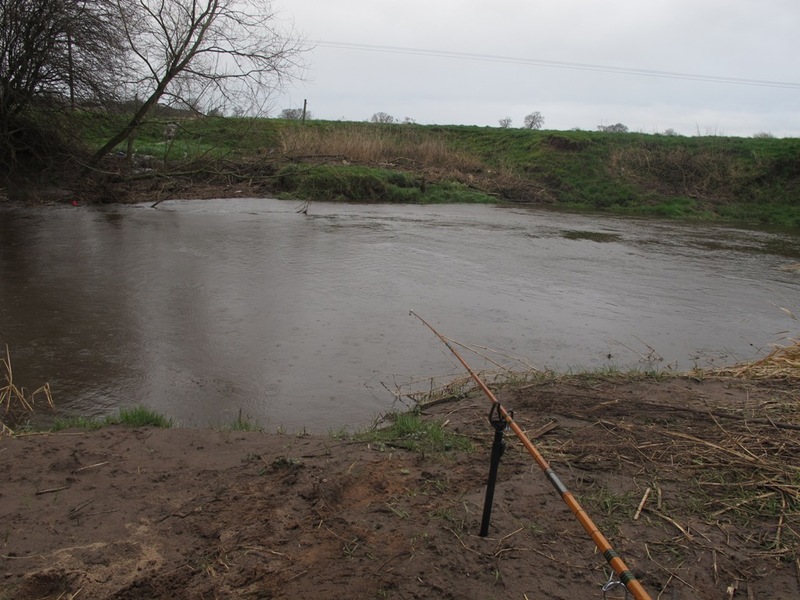 I suggested he sat it out keeping close into the near bank and recasting frequently until I arrived. A good time later I was released from nursing duties and finally on my way, the rain on the motorway told me it wasn’t going to be an easy session and if Phil actually got any enjoyment at all from the day then he’s well on his way to becoming a ‘river rat’. 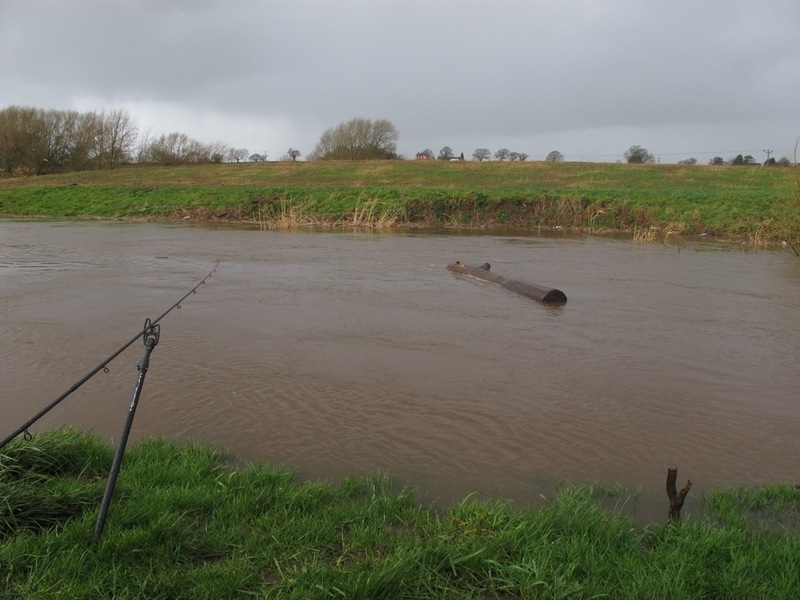 When I eventually found Phil he was hanging on to his brolly for fear of it taking off, the wind was gusting the river was well up and a muddy brown and a large tree trunk passed through our swim just as I’d sat down!! 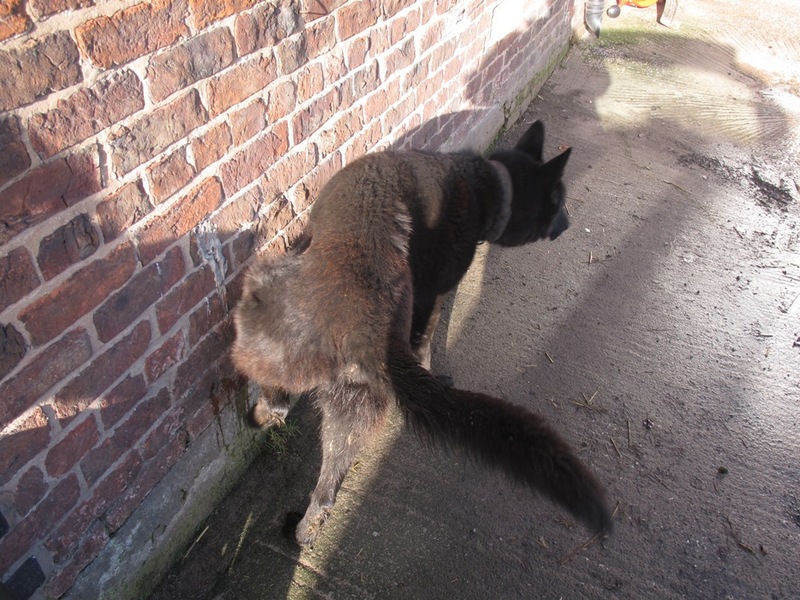 Looking back it was no wonder the conditions were so bad as the river level reached a peak at 3pm on the Saturday afternoon, ‘could this day get any worse’ was a nagging thought and although Phil was being the perfect gentleman the same thought probably passed through his mind also. We gathered our tackle and headed downstream to the Oak Tree swim and upon arrival were greeting by gusty winds of 30mph+ blowing right off the field facing. Fortunately the rain had eased and we set up stall in relatively good humour. Phil fished to my right putting a small chunk of meat directly under his rod tip as advised, this is the spot Phil Hatton (too many Phils!!) had the one and only fish last weekend. I followed with a similar tactic and cast my bait dead ahead in the back eddy, my bait of choice was cheese paste and I applied liberal sprinklings of hemp over both spots. We fished for a further hour or so until eventually the sunset indicated it was time for Phil to go home, to be fair the chap had been there since 8:30am in freezing rain and driving winds and despite a missed bite had no reason to believe the river was about to ‘switch on’ so an apologetic Grazy suggested I take him again in June when this horrible weather has long gone and the river banks had chance to heal. Sunset and time to go home, well it was for Phil anyway. As we walked back to the gate my original plan was to fish the Dead Tree swim where I’d had the double 2 weeks earlier however when we got to the Willow swim I stopped suddenly in my tracks and looked over, it didn’t look inviting then again neither did anywhere else but something in the back of my mind said STOP!! leave your gear here and come back. Maybe it was the fact the wind was dropping and would be on my back, maybe I couldn’t be bothered carrying my gear to the other swim beyond the gate or maybe just for once I was listening to instinct. 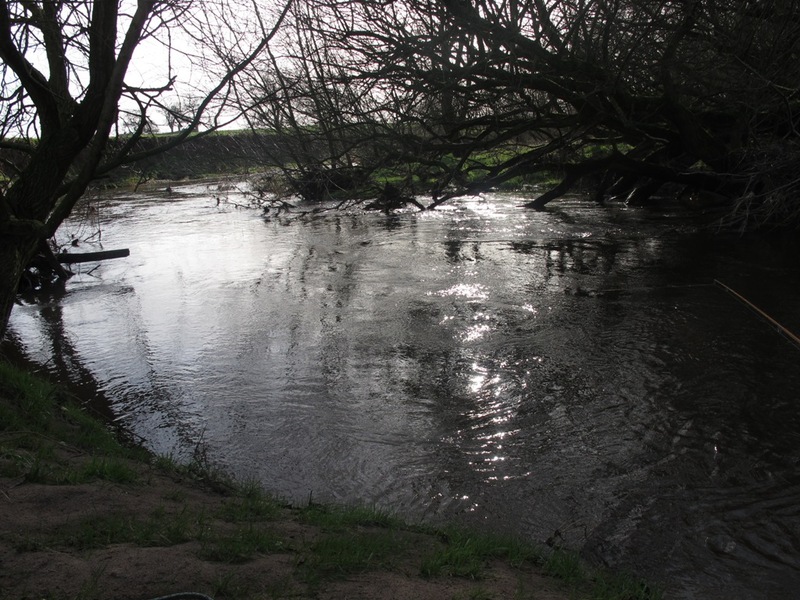 The ‘Willow’ swim, a favourite with most who fish the stretch, could it be kind to me tonight? 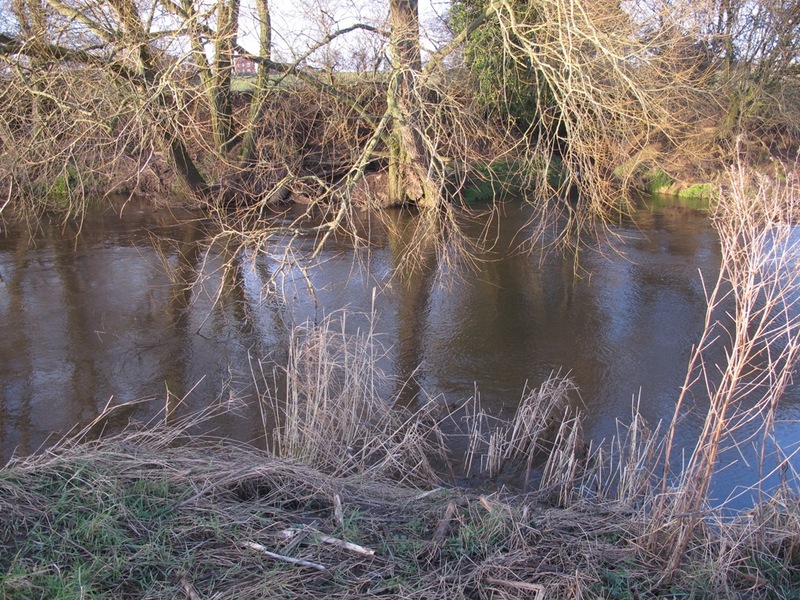 Previously I’d caught a PB Dane chub from this swim, much previously Penno had lost a big barbel at the net from this swim. 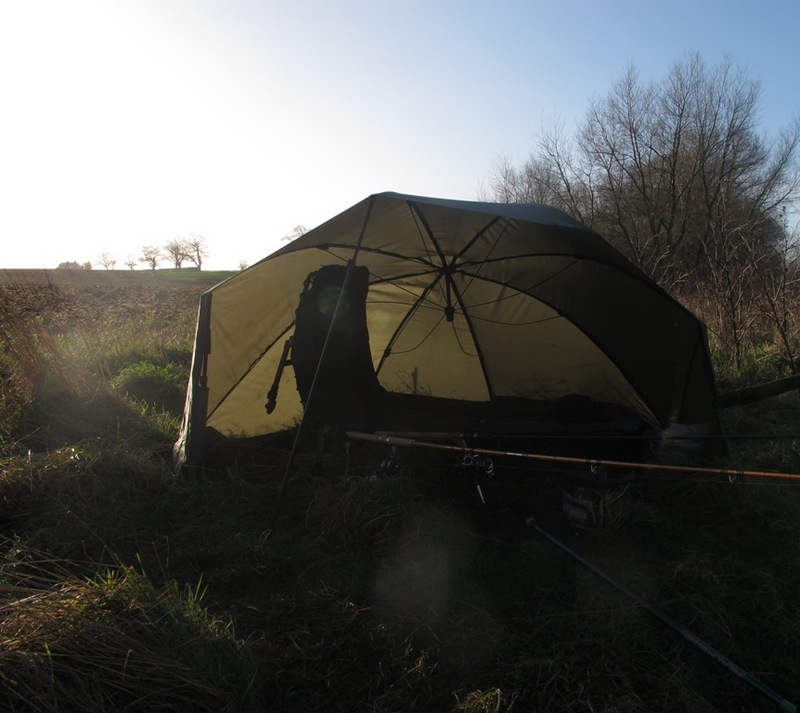 I set up the brolly and battened down the hatches, the wind was directly on my back yet under the brolly all was still, amazing how much comfort that creates so I started to prepare for the first cast of the evening. Phil had kindly given me his neatly diced left over meat and I put two decent handfuls straight in the swim followed by three of hemp. I settled back into the brolly and decided to leave well alone for half an hour, time for a brew and a think. 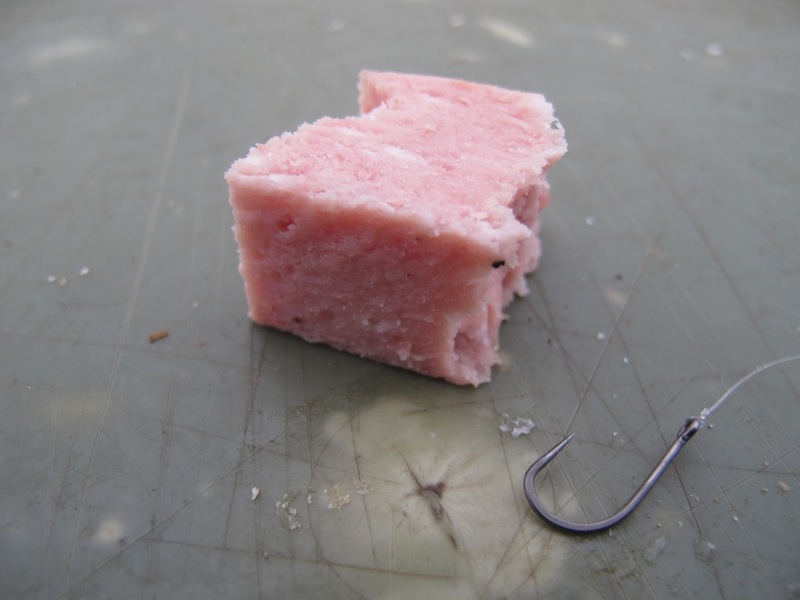 The first cast with nothing of significance, a couple of loops of line pulled off the centre pin and in it went. I’d put a 3/4oz bomb on to hold bottom and a cube of meat on a size 8, the line on the pin was 8lb so it was well balanced for the conditions. The meat landed a rod length out on a crease with a plop, the inside of the bend was flowing at a nice steady pace so I knew it would reach bottom just under what remains of the willow branches. As I secured the button of the rod in the rear rest and lowered it onto the front rest the rod pulled to the left, my first thought was that a drifting branch had ran through the line as it was settling but it pulled again this time more violently than the previous one, I realised a fish had hit the bait almost before it had settled, I lifted into it and felt the resistance. 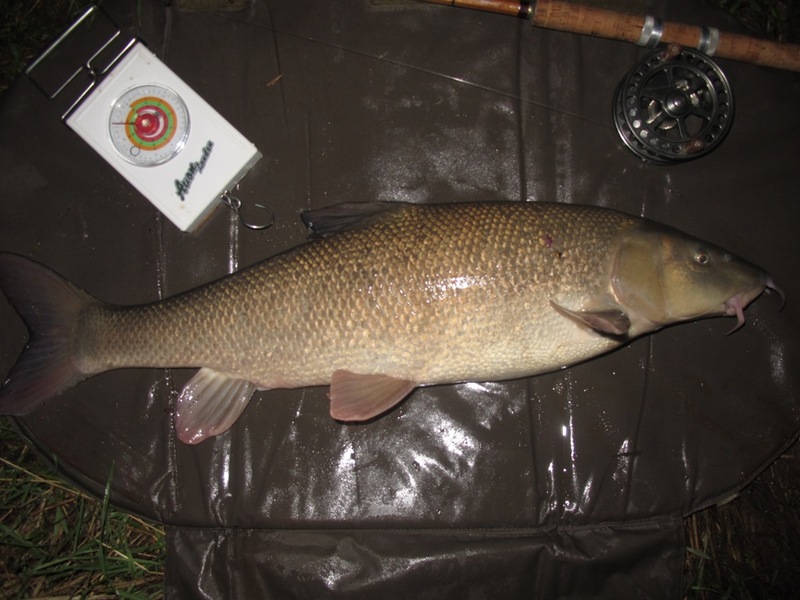 The rod was bending nicely and the reel holding steady, a few jolts on the line told me it wasn’t the chub I was after but a barbel, then all hell broke loose. 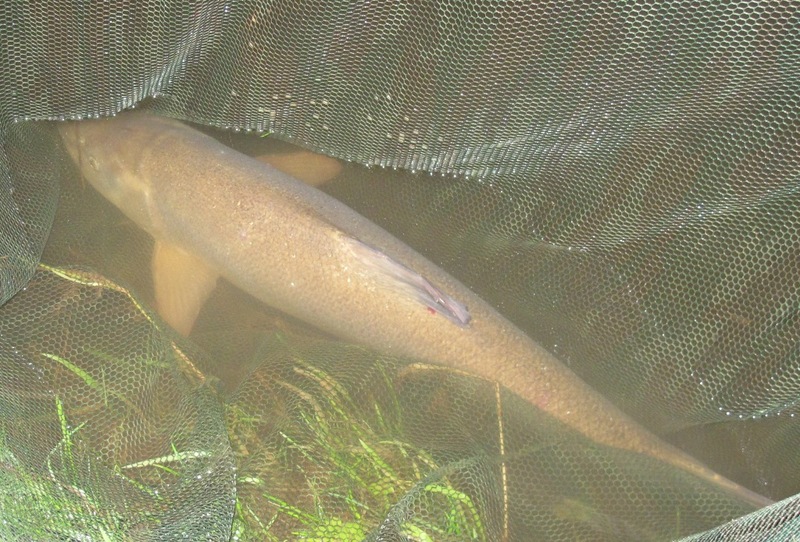 The barbel made a dash downstream under the willow and I held her back in the flow, the next few minutes had to be one of the best fights I’ve had with a barbel at close quarters, I gave line when requested but knew what I’d done two weeks previously on 6lb line so this time I was more bullish and the centre pin was in control so yard by yard I was gaining on the fish. After five or six minutes it was close-in to my left, I reached the net out in readiness for the first sighting and up it came, blimey or words to that effect it’s another good ‘un, it gulped it’s first breath of air and I stabbed at it with the net. In hindsight that wasn’t a good move as it bolted down again for another run, not far this time and I eased it back into the ‘zone’ it shook it’s head in an attempt to evade capture but was back within netting distance again downstream to my left, I held the pin steady and put more strain on the rod and bundled the barbel across the net, it dropped in nicely, result!! Shining the head torch on my prize I knew he looked familiar, a couple of distinct markings near his dorsal told me this could well be the Dane double some 200 yards downstream of where I’d first had him two weeks ago. On the mat he looked a lump and this time framed alongside the centre pin. 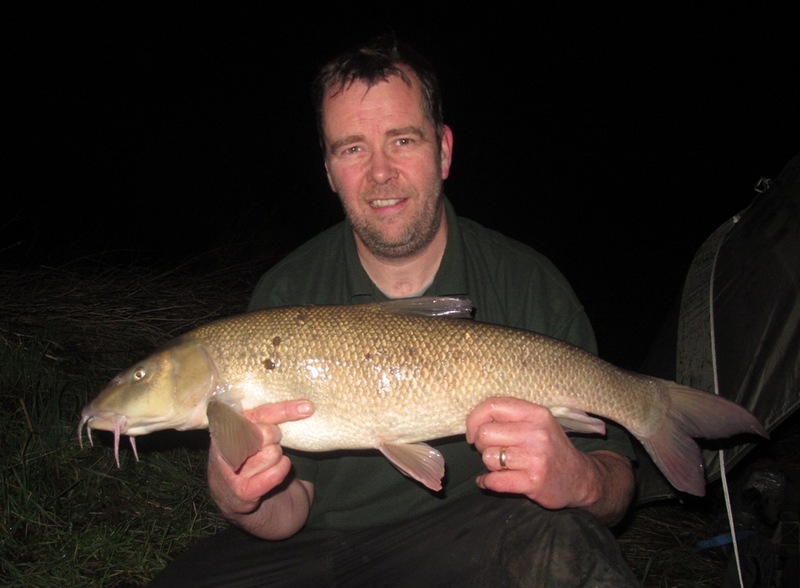 The Avons showed he put 3oz on in two weeks and settled on 10lb 9oz once again a new PB. That finished the evening off perfectly and I was very pleased to say the least, a Dane double is a special fish these days so to catch the same fish two weeks and 200 yards apart is nothing short of a miracle especially since I was chub fishing on both occasions. 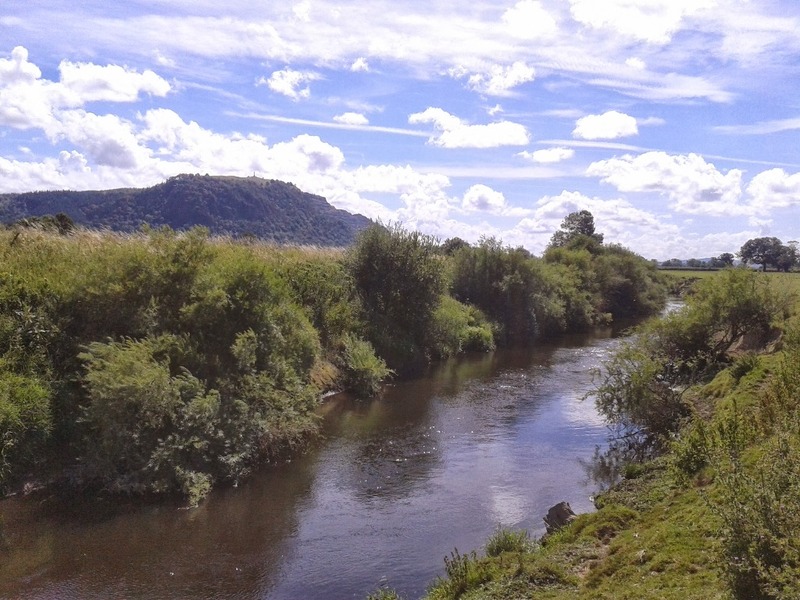 With my first trip to the river Wye in two weeks time to look forward too I went home a very happy angler, no chub for Grazy this time and only one fish banked but what a fish and in flood conditions too!! If you want to follow Bob aka Grazy and his mates on their fishing exploits as they unfold I usually put a post up on Facebook when I’m out so click the button below. Till next time tight lines, Grazy.